What’s up guys!! I got an interesting email the other day from Mika from Australia. Because of the size of his local rink, and the limited number of players there, they play 3 on 3 (which sounds like a blast to me!). 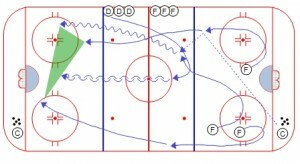 Anyways, he asked if I had any drills that focused on 3-man set-ups and game situations… this drill immediately came to mind! 3. 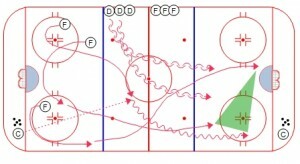 After a quick attack, the same 3 Forwards swing to present themselves again for a breakout, while a Defenseman closes the gap. 4. 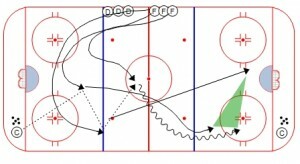 Coach initiates breakout and Forwards attack 3 on 1.
third breakout pass, then attack 3 on 2.